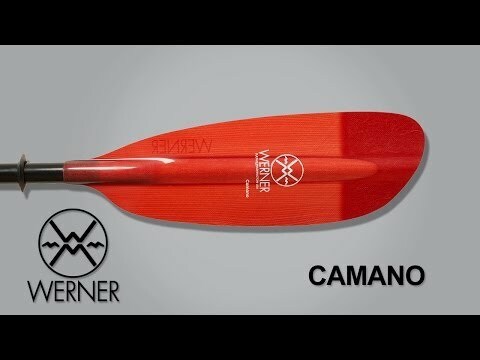 The Werner Camano Hooked Paddle is a great new angling paddle. The best angling paddle is of course the best paddling paddle and the Camano provides the perfect combination for paddlers who want gentle power and use a relaxed all around touring stroke. The Camano Hooked features the award winning Low Angle mid-sized blade design and offers the best balance of light swing weight, durability and performance. It comes in fish color patterns with the Werner Hooked logo. Light weight, very nice. Low angle paddler, mainly fishing. The paddle feels very light in your hands. In use you don't notice the twist or separation you do in most two piece paddles. It feels very solid, paddling is easier with the low angle on a wide fishing kayak. Not to mention it looks great. Totally satisfied. I am faster on the water (speed checked by GPS) yet feel less tired than when using my cheaper paddles. 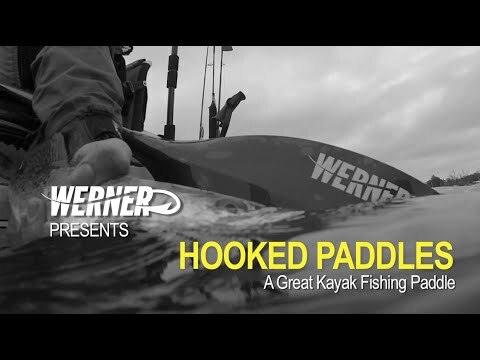 This was my first jump into the Werner paddle lineup and well...I recently purchased ANOTHER Werner Hooked paddle! It's function and style is what really has impressed me. The connection between the two pieces is solid! It feels as if it's a 1-piece paddle. It's also very light!!! I can paddle for hours and not have jello arms at the end of a fishing trip. Currently using the 260cm length paddle with my Jackson Big Rig, which is very wide at 37", and paddling with a low stroke complements it well. 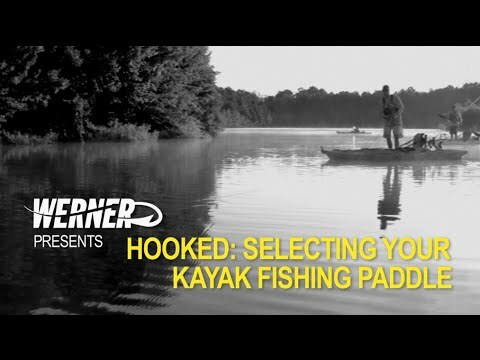 I bought the Werner Camano Hooked paddle when I accidentally left my Bending Branches Pro Angler at the landing, thinking nobody would ever report they found it. I really like the ferrule on the Camano, the weight and the feel of the shaft. The week after I lost the Pro Angler, I went back to the landing and there was a sign saying a person found it. I now have both paddles. Which is better? Very hard to tell. I'll have to bring them both to the water sometime and run a test. Only used this 5 or 6 times but it is very lightweight and seems very sturdy! I love it and would buy it again. I own a Ocean Kayak Trident 13, and I have used a fairly good paddle, for over a year. It served me well, but arms where always tired or sore the following days, and the Hobie Yaks would always walk away from me. Since I have swithched to the Werner, no tired or sore arms, and now I can stay regardless of the distance, I am with my friends witht thier Hobie Yaks. Good job Werner! great paddle! replaced Hobie paddle on my outback. Love this paddle worth every bit of the extra money vs other lesser paddles. Great backbone pushes my large sit on top very well. A: If you are taller than 6' tall I would recommend a paddle length of 250cm or greater, as this is a wide fishing kayak at 34". I personally like a little bit longer paddle. Q: Hi, I'm 5'10" and just got a Vibe Seaghost 110 that is 33" wide. What length Camano would you recommend? A: Hello, a 230 cm-240 cm is what I would recommend for your height and width of your kayak. A: Either boat will be great! With the 13.5 you get better stability and it will track better. Snag a quality paddle (durable and lightweight) in the 230-240cm range. Hope this helps! Q: I have a FeelFree Moken 12.5 kayak. I am 6'1" tall. What length Camano paddle do you recommend? Thanks! A: Thanks for your question! Based on your height and the width of your boat, we would recommend a 240 cm paddle. Q: Does ACK have a military discount? A: We do, however you will need to go into one of the retail locations to get the discount. Q: I just bought a lure 13.5 from you guys. I was gonna order one of these paddles but not sure about a 250 or 260. I'm 6'2"
A: With your height and the width of the Lure 13.5, I would recommend going with a 260cm paddle! Q: Can you confirm that item 13391, Werner camano paddle ,has a carbon shaft? A: Yes this shaft on this will be a carbon shift. Q: I have a Jackson Kraken 15.5. I am 6'3". What size paddle should I get? A: I would recommend a 240cm paddle. Q: What length Werner Camano paddle do you recommend. I recently purchased a Jackson Kilroy Kayak, which is 31 inches wide. I'm not sure what seat position (high/low) I will use the majority of time, but assume 50/50. I am 6' 2". I can't decide between the 240 or 250 length. Also, what size paddle should my wife get using the same kayak. She is 5' 5". Thanks for your help. Q: I am 6'1, my kayak is 29" wide. I kayak with my dog, if that makes a difference. What length paddle do you recommend? Thanks. Q: Does this Werner Camano Hooked Fiberglass Kayak Paddle Straight Shaft have a standard diameter or small diameter? A: The Werner Camano Hooked Fiberglass Paddle Straight Shaft is only offered in the standard size shaft.